I figured since I made mention of the beautiful rendition of the Shadow-Thief in the pages of Hawkworld by Graham Nolan and Rick Burchett on the last post, I should give everyone an example of what I meant. And since I do so love black and white art, I thought this inked page would be a perfect showcase. The page in question comes from Hawkworld #5, during which the Hawks are split up in space, with Shayera piloting the control module of their spaceship to battle a heavy Thanagarian freighter, while Katar tangles with the Shadow-Thief on the main portion. All of the blacks on this page are fantastic, and there is a lot of them, from the starfield to the Shadow-Thief himself to the shilouettes in the final panel. Nolan's pencils are pretty tight, showing nice proportions and anatomy -- except, of course, for the Thief! The third panel, where Shadow-Thief draws his katana to attack Hawkman, is marvelous in the contrast between the realistic look of Katar and the ship and then the flat, elongated body of the Thief. I suspect that a lot of my appreciation for the Shadow-Thief comes from his look, which has always appealed to me. On top of that I also like how his powers -- not being able to be touched -- make him a good foil for heroes who tend to use hand-to-hand weapons. The Post-Crisis revamp of him which goes down in Hawkworld is subtle but effective, making him an industrial spy and ninja, and giving him some combat skills to make him more of a physical threat. In any event this page looks amazing. I've never bought original art pages before, because money, but this is a nice example which would look sharp framed up in my bonus room. Disclaimer: I do not own or have possession of this art. I am simply re-posting it from the site indicated below. 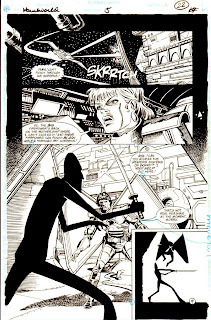 Image: Hawkworld #5, page 19, 1990, Graham Nolan and Rick Burchett, image obtained from Romitaman.com. As I begin my read through of the Hawkworld ongoing, I am struck by several aspects, some of which I expected, some of which I did not. --The incredibly Post-Crisis tone of the book. I knew this was part-and-parcel with this book before I started, so no shock here. The Post-Crisis DCU, from my readings, seemed driven by editorial mandate to remove itself as far as possible from anything Pre-Crisis which might be construed as "silly," "kid stuff," or otherwise "not serious." As a kid growing up, I remember that being the knock on DC books -- I specifically remember my brother telling me once to not bother with a certain DC series because "they're all talk" -- and reading the early issues of Hawkworld pretty much confirms this. I can only assume that DC was trying to raise their profile as the place for more discriminating readers with their "serious" stories. This series is so straight faced that even the comic relief (such as it is) is serious. --The appearance of the Silver Age supporting cast, namely Mavis Trent, Joe Tracy, and Commissioner Emmett. This one was a less expected development. I had figured, what with Hawkworld being such a broad departure from both the Silver Age and then post-Shadow War series, that we would not see the classic Midway City folks cropping up in Chicago. At the very least, I figured, well, we might get the Commissioner, but that's it. So the appearance of Joe and Mavis was a bit of a welcome surprised for me. Turning Mavis into a love interest for Katar is a turn which seems to make sense, and at least she's not as bat-spit crazy as she was back in the 60s. I wonder if she ever makes it onto lists of "characters revamped by the Crisis," since as we all know, the last time we saw Mavis she was, well, not doing so hot. Joe Tracy, so far, has not had much to do in the series, other than pop up from time to time to talk to Katar and Shayera. Given his history in the Shadow War, if he turns out to be more than he seems, I won't be super surprised, but right now I figure he will stay as a cypher. The same goes for the Commissioner -- Shayera's interactions so far have been more with her Sergeant and the officers she is working with, but at least he got brought back. Somehow I doubt he will have any connection to Thanagarian technology this time out. --The politics, including the comparison of the values of America and Thanagar. I knew that this series was political in nature, and given the amount of politics in the miniseries, that's a reasonable approach. I was not, prepared, however, for a treatise on the Constitution and whether or not Americans actually believe it. It's an interesting discussion, and to their credit Truman and Ostrander don't take the easy way out with either flag waving patriotism, nor downtrodden "blame America first" cynicism. So while I think the intent is perfectly clear with the political aspects of the series so far, at least it's been well written. --Shadow Thief shows up within the first 6 issues. Totally did not see this coming. And I love that Graham Nolan and Rick Burchett channel Kubert with his wonderfully abstract anatomy and inky blackness when Sands uses the shadow field. It makes me happy to see both Byth and Shadow Thief being thorns in the Hawks' sides in the Post-Crisis era. No I am awaiting Matter Master and Ira Quimby! So far, 5 issues in, I am very much enjoying the series for what it is -- a serious-minded reboot of Hawkman for the Post-Crisis universe. It's not nearly as fun to read as the Silver Age stories, but that doesn't mean it's not good. All it means is that you have to approach this series with the correct context, and keep in mind the time when it was published, both for DC Comics in general and the world at large. At the end of the day, "A good story, well told," is what I am looking for, and Truman, Ostrander, Nolan, et. al. have been delivering that. My "home" comic convention is, presently, HeroesCon up in Charlotte, NC. There is the new kid in town, the upstart SC Comicon right here in the Upstate, but I was out of town for it this year, so that showdown will have to wait until 2015. In any event, one of the highlight guests for me this year at HeroesCon was Tim Truman, whom devoted Hawkfans will immediately recognize as the writer and artist of the prestige format series. And that's exactly what I brought for him to sign, unsurprisingly. (I left out the fact that I found all three issues for a dollar, but really.) I got a chance to talk briefly with Mr. Truman about Hawkworld, and the changes wrought by the series. The story which Mr. Truman told me was an interesting one -- Hawkworld was originally intended to be a joint project with him on art and Gardner Fox was supposed to write! But, unfortunately, the right before he began work on the series, Truman said he received a call from DC informing him of Mr. Fox's untimely passing. So the project was put on the shelf for a little bit, and became double duty for Truman. Man, I wonder how different the series would have been with Fox writing it? Fox's Thanagar from the Silver Age was a utopia, which the Thanagar we got in Hawkworld is anything but. The other comment which Mr. Truman made was that the whole concept of Hawkworld was to be a love letter to the Hawkman work done by Joe Kubert. And while Kubert's influence on Hawkman cannot be overstated, I personally don't see a whole lot of Kubert's swooping, pulp-influenced style in Truman's work. But I suppose there is a fine line between aping and paying homage. The other big highlight guest with some Hawk work in his portfolio was cosmic scribe extraordinaire Jim Starlin! Along with my copy of The Death Of Captain Marvel, I thought the best way to use my short amount of time with Mr. Starlin would be to bring my copies of the Hawkman Special and Adam Strange Special. Now, part of this was my desire to be the only guy who would bring these books for him to sign, but I also wanted to talk about the Rann-Thanagar Holy War/Strange Adventures story and what was planned for Hawkman as part of the Abberant Six. I told Mr. Starlin that I really enjoyed this run of DC Cosmic, including Synnar The Demiurge and the re-emergence of an alien Hawkman. Mr. Starlin said that he had every intention, directed by DC, to turn Hawkman back into a science fiction character again, but those plans came off the rails when Geoff Johns said he needed Hawkman as he was for Blackest Night, and that took precedent over what he was doing. Which jives with what I had speculated back in the day, for whatever that's worth nowadays. Mr. Starlin also told me a tidbit which really amused me -- he admitted that at the time he first drew him, Hawkman was the hardest character to draw! All of the feathers and details apparently drove him crazy. But he also admitted that another character supplanted Hawkman as the most difficult to draw -- Annihilus, to the point that he redesigned him to make him easier to draw! The other Hawk creator I spoke to was Frank Tieri, who stepped in after the Rob Liefeld dust up. But we talked about his work on Iron Man rather than the Winged Wonder; in any event, Mr. Tieri is a great guy and a lot of fun to talk to. All told, HeroesCon was a successful convention; I have often said that you get out of a con what you put into it. I tend to go to comic cons for more the capitalistic side than the creative side, but while I was able to reap some benefit from the back issue bins (DC Comics Presents #74! ), I got a lot more out of Artist's Alley this time out.